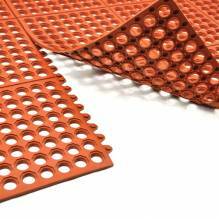 Ensure the comfort and safety of your employees by adding anti-fatigue and terracotta rubber floor matting to your establishment! Must-have additions to any behind-the-counter service, these anti-fatigue mats provide standing relief and help prevent slipping on wet surfaces. Ideal for behind the bar and kitchen operations, where spillage and breakage occurs often. 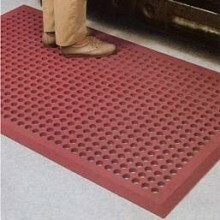 Outfit your establishment with these durable rubber mats. Featuring beveled edges to reduce tripping, and to increase their accessibility within the flow of the establishment by accommodating carts and trolleys easy access to roll over. 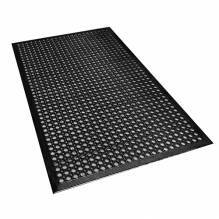 Achieve a more secure and comfortable work environment with the open design of these mats!